We are offering wide range of EBT Series Ultrasonicator for research and processor applications for cell lysis, nano particle preperation etc. Models ranging from 150 watt upto 1800 watts. Sample disintegration probes made of titanium volume ranging from 5 ml upto 1500ml capacity . Sound proof box. Timer the ultrasonic processor EBT 1800 (1800 watts, 20khz) is our most powerful laboratory device. With sonotrodes of a diameter range from 2 to 25 mm the device is suite for sample volumes from 5 to 1800 ml. In flow approx. 10 to 50 liters per hour can be treated. For the preparation of test portions the EBT 1800 is mainly used for bigger volumes. It is suited for the practical process development in the laboratory but also in the college of technology as well as for the production of small quantities. For production quantities a pc-control or a connecting lead to a central control of the user's plant is recommended in order to raise the process safety. With special flow cells and flange connections liquids can also be sonicated at high temperatures and pressures. High power generates the intensive aviation required, but this results in unwanted noise. For operating the EBT-1800 we recommend to use the sound protection box. Low-temperature ultrasonic extractor / ultrasonic processor is the application of modern ultrasonicator combined with low temperature system as a physical means of new chemical reaction device, occurred mainly by high-power ultrasonic system, heating system, the compressor cooling system, temperature control system, temperature, agitation system etc. Is higher than 20000Hz frequency ultrasonic sound waves. It is spread in the medium ,which can cause severe friction between the media elements and heat dissipation, resulting in a variety of primary and secondary effects of ultrasound, such as ultrasound thermal effect, chemical effect of cavitation and other physical effects. As the ultrasonic "cavitation" effect may cause changes in activity of reaction system to produce enough to trigger the instantaneous high temperature and pressure chemical reactions, the formation of a local high-energy centers to promote the smooth progress of chemical reaction, which is the main chemical reaction catalyzed ultrasonic factors. The secondary effects of ultrasound such as mechanical shock, emulsification, dispersion, crushing are beneficial to the full range of reactants are mixed, than the general phase transfer catalysis and mechanical agitation to promote more effective reaction to proceed smoothly, it gradually into the ultrasonic technology chemical laboratory, as a means of physical catalyst, the reaction of organic chemistry greatly changed the outlook. 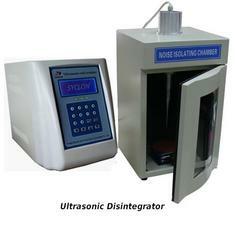 We are a manufacturer of non-contact ultrasonic cell crusher in india. We have been supplying our products to all over india and foreign countries. We manufacture our products based on industrial standard in order to ensure quality products.The cup horn enables sonification of a sample without the horn coming in contact with the solution. It can simultaneously process a number of sealed vials or test tubes with identical parameters. It is also called ultrasonic homogenizer,processor or diperser. A sonicator system is comprised of 3 major components: generator, converter and horn (also known as a probe). The ultrasonic electronic generator transforms ac line power to high frequency electrical energy. The generator features a keypad or buttons which allow the user to control the sonication parameters. The generator provides high voltage pulses of Energy at a frequency of 20 khz that drives a piezoelectric converter. The converter is a cylindrical device which is connected to the generator by a high voltage cable. The converter transforms electrical energy to mechanical vibration due to the characteristics of the internal piezoelectric crystals. The vibration is amplified and transmitted down the length of the probe/horn. Probes have threaded ends and attach to the converter. During operation, the probe’s tip longitudinally expands and contracts. Amplitude is the distance the tip travels and is dependent on the amplitude setting selected by the user. Series is integrated with temperature monitor optional. Temperature monitor to protect sample from overheating. Ultrasonic homogenizer is an ultrasonic cavitation in liquid effects versatile, multi-purpose instrument. It can be used a variety of animals and plants, viruses, cells, bacteria and tissue broken, but can be used to emulsification, separation, homogenization, extraction, anti-foaming, clear, Nanomaterials, distributed and speed up chemical reactions. Instrument is widely used in biology, microbiology, physics, zoology, agriculture, pharmaceuticals, chemicals, sewage treatment, nano-materials and other fields. Microcomputer control, can store 50 groups of work data. Ultrasonic time, ultrasonic power can be set. Automatically detect ultrasonic power to prevent the ultrasonic power with the sample temperature change. Integrated temperature control to prevent overheating of the sample. Standard configuration: SJIA-1200W includes a 25mm probe and sound abating chamber. Parameters including processing times, pulse on/off and power output ,it can be saved to memory and run by the touch of a button.This new system can restore more than 50 custom program. The Sonicator digitally tracks frequency changes in the converter/ tip assembly caused by load and temperature changes and maintainelectrical efficiency at all times. Manual tuning is unnecessary. Full Amplitude Control: Amplitude (intensity) is controlled from 1-100% giving a greater degree of resolution and the ability to pinpoint the amplitude needed to effectively process your sample. Programmability: Parameters including processing times, pulse on/off and power output ,it can be saved to memory and run by the touch of a button.This new system can restore more than 50 custom program. Pulse Mode: Adjustable pulse On and Off times to reduce the heat gain in temperature sensitive samples. changes and maintainelectrical efficiency at all times. 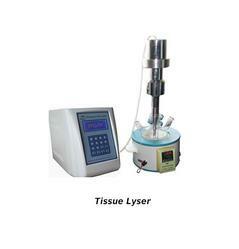 We are a Tissue Lyser manufacturer in India. We have been supplying our products to customers from all over India. In further extension we have been exporting our product to foreign countries also. Auto Tuning: The Sonicator digitally tracks frequency changes in the converter/ tip assembly caused by load and temperature changes and maintainelectrical efficiency at all times. Manual tuning is unnecessary. Ultrasonic Processor / Ultrasonic Homogenizer / Ultrasonicator It is also called Ultrasonic homogenizer,processor or diperser. A Sonicator system is comprised of 3 major components: Generator, Converter and Horn (also known as a probe). The new model of the SKL-IIDN features: series is integrated with Temperature Monitor optional. LCD display screen clearly displays all operating parameters and options: Temperature, time, output power etc. Temperature monitor to protect sample from overheating. This Portable Ultrasonic Processor is a powerful max upto 650 W, is ideal for processing samples ranging from 0.2 to 500 ml. 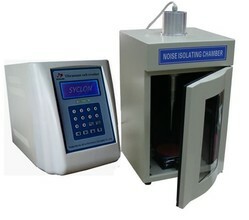 Portable ultrasonic cell crusher is a use of ultrasonic cavitation in the liquid effect in the multi-function, multi-purpose equipment; It for a variety of animals and plants, viruses, cells, bacteria broken, can also be used to emulsify, disperse, homogenization, extraction, anti-foaming, cleaning, preparation of nano-materials, dispersion, and speed up chemical reactions. Portable ultrasonic cell crusher is new product, feature full, reliable performance. Instruments used LCD display, ultrasonic time and power arbitrarily set the sample temperature measurement showed that frequency automatically. Cup Booster Horn Ultrasonicator enables sonification of a sample without the horn coming in contact with the solution. 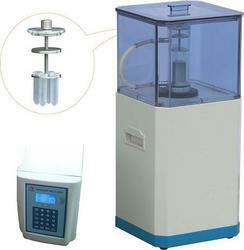 It can simultaneously process a number of sealed vials or test tubes with identical parameters. This indirect Sonication eliminates the need for a probe to come in contact with your sample. This technique is often described as a high intensity ultrasonic bath. The ultrasonic energy is transmitted from the horn, up through the water and into a vessel or multiple sample tubes. Ultrasonic reactor, also known as Continuous Flow Ultrasonic Homogenizer, the complete function, beautiful appearance and reliable performance. Apparatus using a large screen display, the central computer centralized control, ultrasonic gap time is adjustable, power 1-99%. 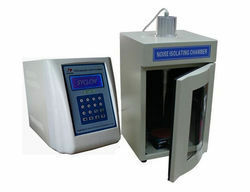 Sample temperature control can be set to show the actual frequency display, frequency automatic tracking, automatic fault alarm, use double cup design and cooling fluid can be used in conjunction with the thermostat bath, the material used cup and horn Live access, loading and unloading easy, capacity-hour, material can be removed as a routine ultrasound cup grinder to use.